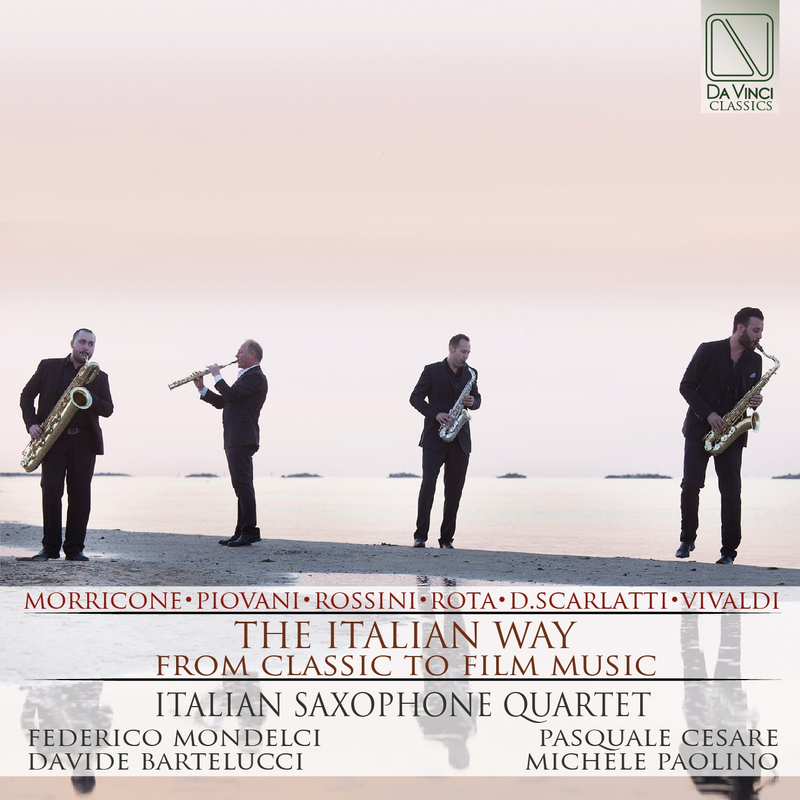 In this album, dedicated to Italian composers, the Italian Saxophone Quartet contrasts three great composers of the past, Antonio Vivaldi, Domenico Scarlatti, and Gioachino Rossini, with three extraordinary composers of film music, Nino Rota, Ennio Morricone, and Nicola Piovani. To better understand the proposal and the stylistic choices of this CD, it is helpful to consider some historical aspects of the evolution of the saxophone quartet literature. The saxophone is the only acoustic instrument in the history of music whose invention can be ascribed to a single person. Its inventor, the Belgian Adolphe Sax (Dinant, November 6, 1814 – Paris, February 7, 1894), from whom the instrument takes its name, created a whole family of saxophones in 1840 that included all the voices, from the low to high registers. Nicola Piovani: (b Rome, 26 May 1946). Italian composer. He studied privately and after graduating in the piano at the Milan Conservatory (1967) became a pupil of Manos Hadjidakis (1969). Of his more than 80 film scores, the first was for Silvano Agosti. A spare, personal idiom – contemporary but also suffused with archaic traces – is to be found in his work with Marco Bellochio (Nel nome del Padre, 1970; Sbatti il mostro in prima pagina, 1973; Marcia trionfale, 1975) and the Taviani brothers (La notte di San Lorenzo, 1982; Kaos, 1984; Good Morning Babylon, 1987; Il sole anche di notte, 1990). His scores for Fellini (Ginger and Fred, 1985; L’intervista, 1987; La voce della luna, 1990), however, are memorable more for the prestige they brought than for their expressive qualities. As well as other film collaborations with Sergio Citti, Mario Monicelli, Giuseppe Bertolucci, Luigi Magni, Nanni Moretti and Bigas Luna, Piovani has written a considerable amount of incidental music (for Carlo Cecchi, Luca De Filippo, Maurizio Scaparro and Vittorio Gassman) and has had great theatrical success with his racconti musicali on texts by Vincenzo Cerami (La Cantata del Fiore, 1988; La Cantata del Buffo, 1989). Other works include a musical, I setti re di Roma (1989), to a libretto by Luigi Magni, a ballet, Fellini (1995), further racconti musicali, Il signor Novecento (1992) and Canti di scena (1993), and chamber music, including an octet (Quattro canti senza parole), a piano trio (Il demone meschino), a flute and piano duo (Ballata epica) and a saxophone quartet (L’assassino). He has been awarded a Nastro d’argento. Italian Saxophone Quartet (Saxophone Quartet), Federico Mondelci, Soprano Sax Davide Bartelucci, Alto Sax Pasquale Cesare, Tenor Sax Michele Paolino, Bariton Sax The Italian Saxophone Quartet was founded in 1982 by four saxophone soloists, close friends determined to join together to perform chamber music for saxophone at the very highest artistic level. Now nearing the thirty-year mark as a group, they have played to wide acclaim in more than 500 concerts in Italy (including the most important concert institutions), France, Germany, Spain, Greece, Japan, USA, Sweden, Lebanon, Bermuda and Russia. The quartet’s concerts have been recorded and broadcast by the Italian RAI-Radio 1 and RAI-Radio 3 as well as by Swedish, German, Japanese and American national radios. The quartet has won a number of important chamber music competitions including the unanimous First Prize, plus a special prize, at the prestigious “Premio Ancona” in Italy. Among their important projects, in 1999 the quartet performed Berio’s work “Outis” with the Symphony Orchestra of Milan’s Teatro alla Scala. They recently appeared as soloists with the Malipiero Symphony Orchestra in works by P. M. Dubois and A. Piazzolla, and collaborated with the Fonè String Quartet on the creation a new arrangement of the Art of the Fugue by J.S. Bach for string and saxophone quartets, which was premiered at the 22nd International Chamber Music Festival in Asolo. Since 2002 the ISQ’s annual tours of the United States have brought them to New York City (where they showcased at the annual Arts Presenters Conference), the Los Angeles County Museum of Art, and other venues in California, Florida, Georgia, Colorado, Oregon, Washington, Minnesota, Idaho and Alaska. Recent international activities include concerts at the Bermuda International Festival, the Alicante Festival (Spain), the Oleg Kagan Musikfest in Munich (Germany), the Palaces of St. Petersburg Chamber Music Festival (Russia), and the Al Bustan Festival in Beirut (Lebanon). Highlights of their discography include two CDs on the Delos label and a CD of contemporary music on the Pentaphon label.